Quebec City, Canada – When Bernard “The Executioner” Hopkins faces WBC, Ring Magazine and IBO Light Heavyweight Champion Jean Pascal on December 18 at the Pepsi Coliseum in Quebec City, Canada live on SHOWTIME® in the U.S. and on pay-per-view in Canada, he will be 28 days shy of his forty-sixth birthday. If Hopkins defeats Pascal, he will become the oldest fighter in the history of the sport to win a significant world title, 38 days older than “Big” George Foreman was when he defeated Michael Moorer for the Heavyweight World title on November 5, 1994. Despite his age, Hopkins has shown no signs of slowing down. He has won five of his last six fights and is no stranger to facing younger opponents with five of his in-ring rivals having been over a decade younger than him during his 22-year career. The most notable of these was Kelly Pavlik, whom Hopkins defeated on October 18, 2008. At the time of the Pavlik vs. Hopkins fight, the 17-year age gap between the two foes was the largest of Hopkins’ career, until now. “Dynasty: Pascal vs. Hopkins” is promoted by Groupe Yvon Michel Inc. and Golden Boy Promotions and presented by the Casino de Montreal, The City of Québec Tourism, Coors Light and Videotron. The 12-round world championship fight will take place December 18 at the Pepsi Coliseum in Québec City, Canada and will be televised live on SHOWTIME in the United States at 10:00 p.m. ET/PT (delayed on West Coast) and distributed live on pay-per-view in Canada on Canal Indigo, Bell TV, Shaw TV and Viewer’s Choice in French and English at 7:00 p.m. ET. 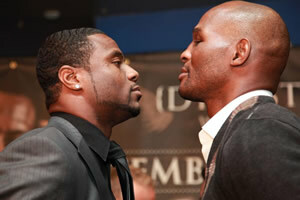 Tickets for Pascal vs. Hopkins, priced starting at C$25 are on sale now at Pepsi Coliseum Box Office, by calling 418-691-7211 or 1-800-900-SHOW or online at www.billetech.com. Also available at Club de Boxe Champion 514-376-0980 and Groupe Yvon Michel Inc. 514-383-0666.